When the temperatures drop, there's nothing I crave more than a delicious, hearty soup. And this past weekend, I just had to indulge. 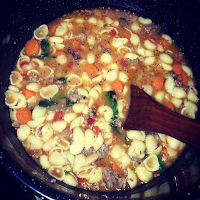 Behold, my first homemade soup attempt ever: Tuscan Sausage Soup! I found the original recipe from Feast on the Cheap. On a side note, if you haven't visited their site before, you should. The mother daughter duo behind the website offer budget conscious recipes that are low on cost, but not on taste. 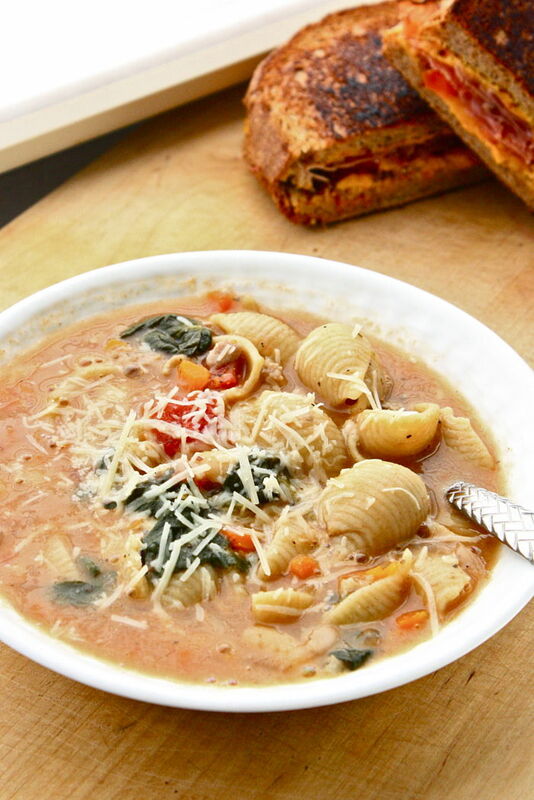 If the rest of their recipes are even half as good as the Tuscan Sausage Soup, I know I'll be back searching for more. So here it is! 1. Brown sausage in a large soup stockpot. Make sure to break apart the sausage as you brown it. 3. Add the chicken broth, tomatoes, cannelini beans, basil and shell pasta. Cook until soup comes to a boil, and then let simmer for 15 minutes. 4. Add spinach. Cook until spinach has wilted. 5. Add salt, pepper and parmesan cheese if desired. Eat and enjoy. p.s. feeling a little under the weather? Me too. Trust me, this helps.